THIS was our campsite! See that blue on the horizon line? That would be the Pacific Ocean! That would be the beach (with a little bern to protect us from the waves). The tide was about 50 steps from our campsite. 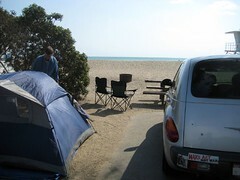 We've camped a fair amount along the southern California coast, but this was the best location ever. We just camped one night, as usual, walked the beach in the afternoon, and morning. It was the perfect location of all time. Love the bumper sticker:) and the beach!